This simple beef stew is one of the first things I ask my mom to cook whenever she visits or when I visit her. 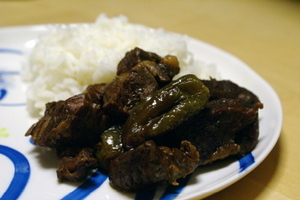 The beef is fork-tender because it's braised in a sweet (but not too sweet) soy sauce. It's a comforting crowd pleaser and, because it's better the next day, you can cook a batch on the weekend and serve it during the week. Don't be put off by the amount of chili peppers in the stew—it needs that many to give it its special flavor. Despite the abundance of chilis, it never gets beyond mildly spicy. Try this the next time you want to make beef stew but don't want to make the same ol' recipe. Place all ingredients into a heavy-bottomed pot (Staub or Le Creuset enameled cast iron Dutch ovens also work well for this). Just whack it all into a pot. Bring to a boil and then reduce heat to a simmer. Cover and cook for at least an hour, preferably longer, until beef is tender but not falling apart. Even better the next day. And the sauce is delicious on rice. Serves 4-6. Accompaniments: steamed rice, kimchi, vegetables. Would this come out the same if made in a pressure cooker? I grew up eating this dish as well and my mom used to add whole garlic cloves, which end up quite tender, and hard-boiled eggs (peeled). The eggs soak up the sauce and makes for a great side dish...just slice & serve. De, I think this would be great in a pressure cooker. JA Mom, I will have to try the garlic and eggs. That sounds delish. This looks interesting. Brown sugar and soy is a nice combination. I would think that the whole jalapenos would be too hot... I will have to try this. I just tried this last night and it was delicious! I made mine in a pressure cooker and it took about 30 minutes from prep to finish. Thanks for a great recipe. Ths sounds realy good- what about a crock pot? DO you think it would work? I am always looking for things I can prep beofre work that will greet me with a cooked dinner when I get home! That looks too east not to try. That's an awful lot of chilis though... you sure you don't have a different heat scale because your palate grew up with korean food? ;) There's a JA dish (shoyu chicken) and Filipino dish (adobo) which a very similar, soy sauce braised dishes which we love. So I'm sure we'll love this one too. Just had this for dinner tonight - hubby said it was just like the version his mom used to make (minus the hard boiled eggs - didn't realize that was so popular). Thanks for such an easy, delicious dish! P.S. 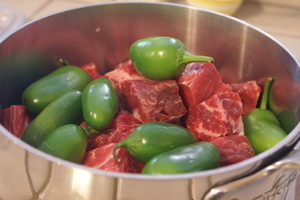 - We put in 10 jalapenos and will probably add more next time; there really isn't much heat and the peppers themselves become so mild and yummy during the simmer. i am making this friday. i need to pop it in the crockpot though...any words on that? also, my jalapens were the size of bananas so i am thinking maybe the full amount would be too much? the bf is half indonesian so no stanger to heat but me and the littlefoodie are super honkies and can't take it. oh, and soy sauce...we use the think syrupy abc kind..is that anything like the korean? its what the indo inlaws use! This looks so good! You should cross-post the recipe. hi there! i found this blog via kimchi mamas. :-) i decided to try this out since my own mother isn't good at giving me recipes - just estimations. i let this simmer for a few hours and the jalapenos made it spicier than i wanted, but otherwise it was very close to my mom's. i guess i just have some sensitive spicebuds. :-P i added some garlic and boiled eggs (as JAMom suggested & as my mom does as well). hope this is the right way to do it. i'm not totally up on my link etiquette. Good post, this looks interesting.